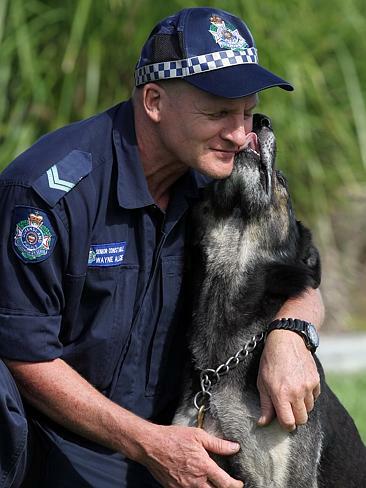 FAMED police dog Bosun has died just one year after retiring. 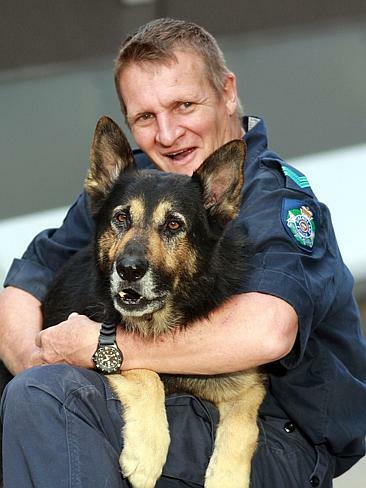 The beloved German Shepherd, who caught the killers of Senior Constable Damian Leeding in 2011, passed away this morning after a short illness. Bosun tracked the gunman, Phillip Graeme Abell, into “pitch-black’’ bushland after tracking him 350m into scrub on the fateful night. 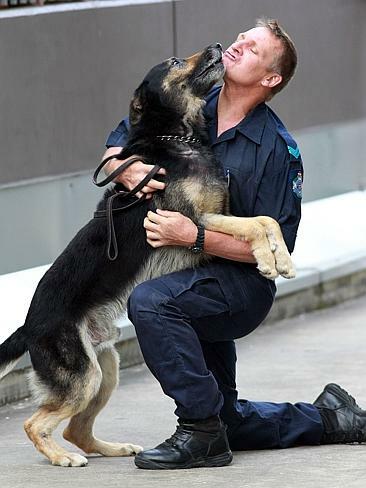 Bosun’s handler Senior-Constable Wayne Algie said the leash went slack and he drew his firearm and a torch to see the dog had bitten a man and was holding him by the left armpit. 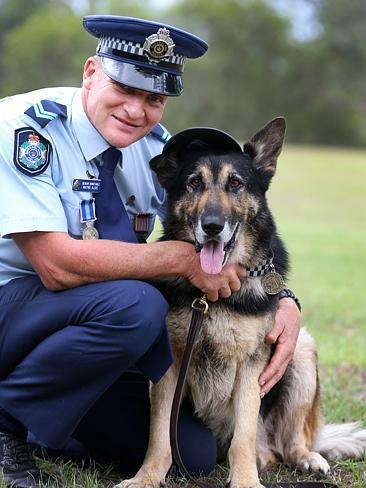 The nine-year-old dog died just months after receiving the Australian Defence Force Service Medal for his long career. The medal ceremony was his last public outing before retiring to the home of his handler, Sen-Const Algie. 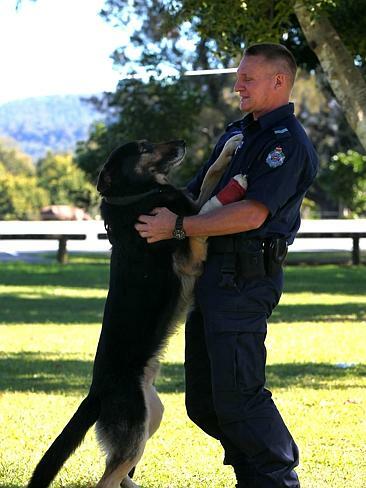 Read tomorrow’s Gold Coast Bulletin for Sen-Const Algie’s emotional tribute to Bosun. 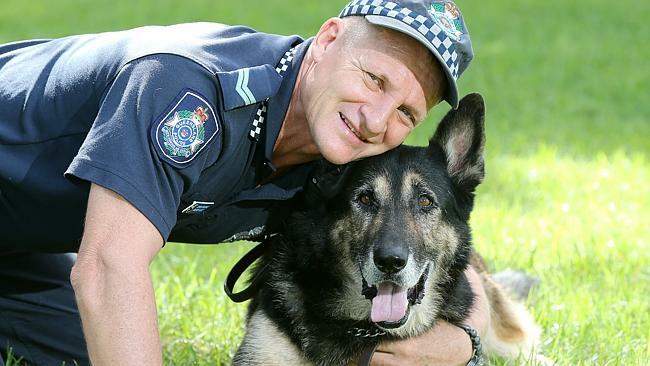 THE Dog Squad officer who risked his life to hunt down the gunman who killed Gold Coast Detective Damian Leeding has been nominated for the highest bravery award available in the Queensland Police Service. Speaking exclusively to the Bulletin, Wayne Algie recalled the night that earned him the nomination for the Valour Award — given to an officer who performs an act of exceptional bravery in hazardous circumstances. Detective Senior Constable Leeding was shot in the head and died days later in hospital. His murder led to an outpouring of support from the Gold Coast community, who turned out in the thousands for his funeral. That cold night in May 2011 started out as any other for the handler and his dog. 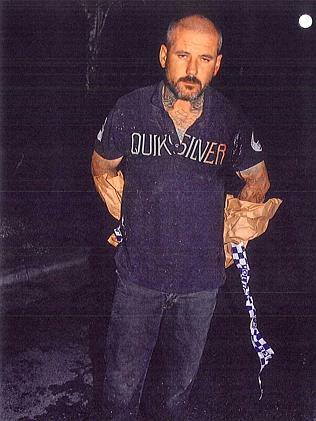 It ended with the fatal shooting of an officer at the Pacific Pines Tavern and stalking a man with a fully loaded gun in dark bushland. Police had no idea where cold-blooded killer Phillip Graeme Abell was camped in the thick scrub, or if he was prepared to shoot again. 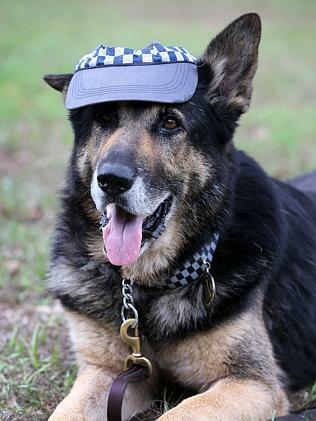 For Sen-Constable Algie and his police dog Bosun, it didn’t matter. It was a risk they were prepared to take after Bosun picked up the bandit’s scent leading into dense bushland. To get there, they would have to cross an open field — no cover and totally exposed. “I grabbed Bosun and asked for volunteers, who was going to come with us, and a first-year officer put his hand up and said, “I’ll go”. “They started to organise a cordon, but I knew the area. I’ve actually trained in it. “It was a two-minute-old track — it was the best chance to get the gunman. “He had already shown that he was prepared to shoot a police officer. I was hoping he wasn’t sitting there, waiting for me, that’s what I was ­thinking. “Actually entering the bush was the most dangerous time. The light was at my back. It would light us up, but I knew once I was in there, it would be pitch black. Sen-Constable Algie and Bosun tracked the scent, moving slowly through the scrub for around 300m. “I could not see Bosun. You couldn’t see your hand in front of your face, it was that dark. “Comms were turned down so not to give away our position. “We were moving as slowly as I could, so I wouldn’t lose my back-up. “ There was no sound — he doesn’t bark — and suddenly the line went slack. Sen-Constable Algie looked into the cold eyes of a killer. “I looked at him and you could see he was thinking about having a shot at me. “He thought it was just him and me at first. He was weighing it up and then he’s spotted the bloke behind me. “You could see the fight go out of him. He realised then it was over. “We handcuffed him and marched him out. 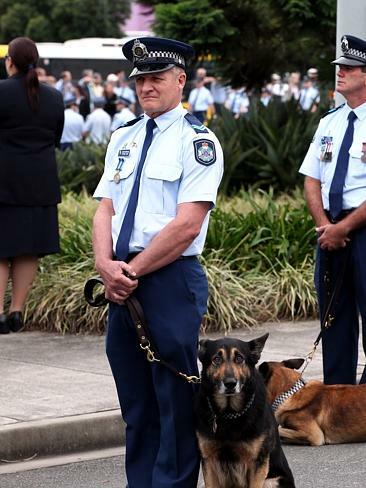 Coomera CIB boss Detective Senior Sergeant Marc Procter said the bravery of all police on that night was ­remarkable. 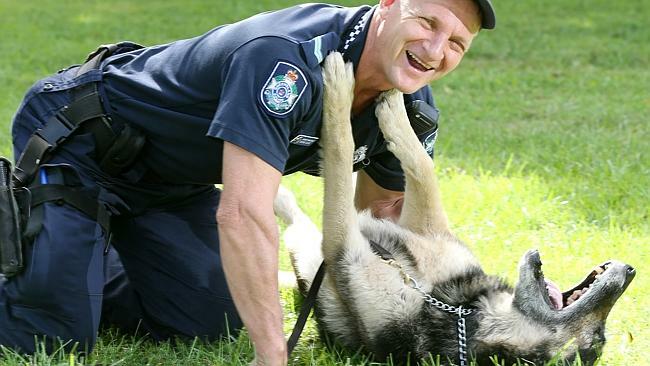 “The action of Senior Constable Wayne Algie and his police dog Bosun was the single bravest act I have ever seen in 25 years of policing,” Sen-Sgt Procter said. Bosun is now retired from duty and has the run of the Algie family home. UPDATED: COP killer Donna Lee McAvoy has been sentenced to life in prison with a non parole period of 15 years for murdering Gold Coast detective Damian Leeding. Accomplice Benjamin Ernest Power has been sentenced to nine years prison for manslaughter. He has been declared a serious violent offender. EARLIER: The sister of slain Gold Coast detective Damian Leeding has mocked his killers in court for their roles in the crime. In a victim impact statement, a furious Hayley Sinton told Donna Lee McAvoy and Benjamin Ernest Power her grief had turned to anger since the killers’ trial last September. She glared at the pair as they sat in the dock and loudly told them their actions had changed her family’s life forever. “I can’t for the life of me understand why none of you stopped to aid a dying man,” she said from the witness box before a packed court. Ms Sinton vowed to do whatever she could to make sure the pair stayed locked up forever. She said she was looking forward to finally taking a much-needed holiday, “sipping cocktails” and watching her children play at the beach. “You will be in jail. I hope it’s as lonely and as miserable as that plainly sounds,” she told McAvoy, 40, and Power, 39, in the Supreme Court in Brisbane on Friday. Detective Senior Constable Leeding’s mother Julie Waters condemned the “cowardly” killers who had shown “no remorse”. “I do not know how anyone could walk past … a fatally wounded man and leave him to die,” she said during her victim impact statement. 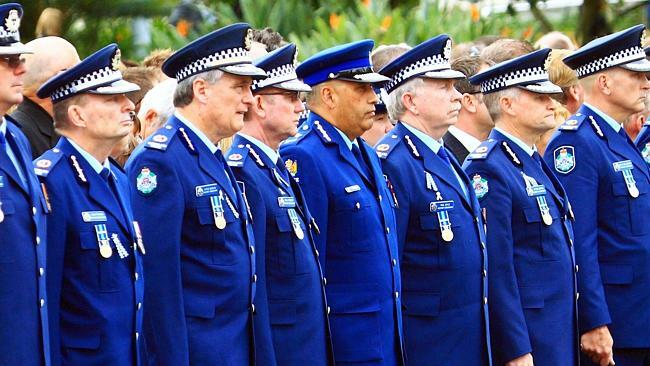 The 35-year-old police officer was shot in the head while trying to stop an armed robbery at the Pacific Pines Tavern in May 2011. 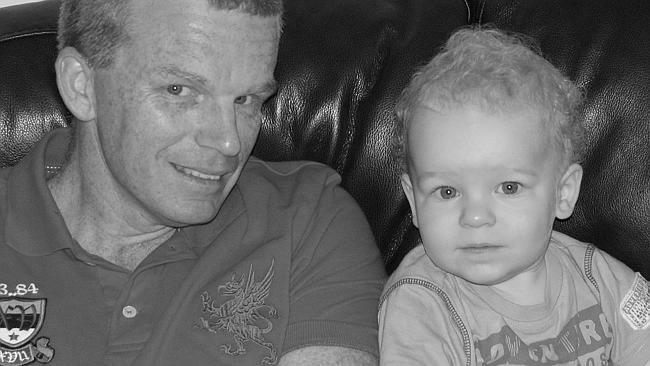 Gunman Phillip Graeme Abell, 41, and accomplice McAvoy were found guilty of murdering the father-of-two last September. Getaway driver Power pleaded guilty to manslaughter. Abell was sentenced in October to life imprisonment with no parole for at least 20 years. EARLIER: Two people involved in the shooting of Gold Coast policeman Damian Leeding are due to be sentenced today. 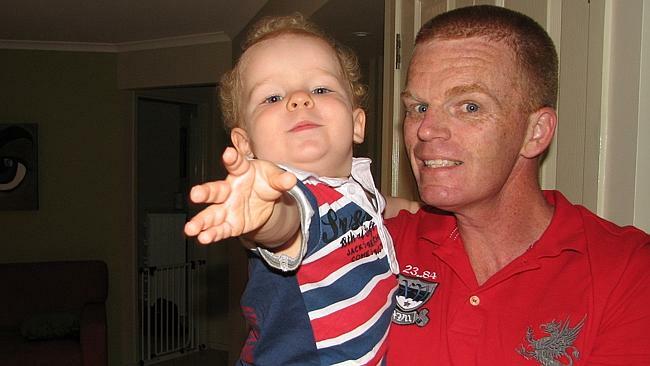 Detective Senior Constable Leeding was fatally shot in the head when called out to respond to an armed robbery at the Pacific Pines Tavern in May, 2011. The man who shot him, Phillip Abell, was last year sentenced to life for murder following a trial. 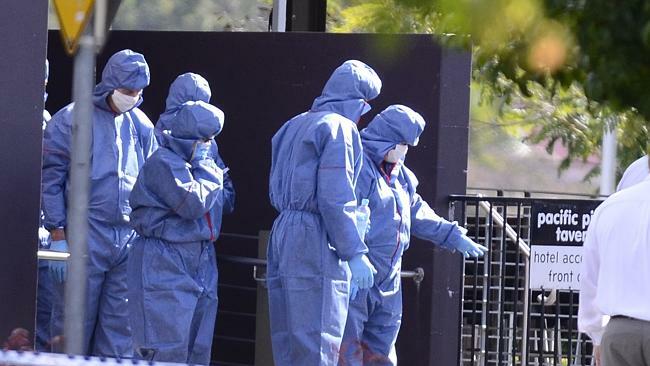 Co-accused Donna Lee McAvoy was also found guilty of murder after trial and will this morning be sentenced in the Supreme Court in Brisbane on a number of charges the killing, deprivation of liberty and robbery with violence. Getaway driver Benjamin Ernest Power is also listed for sentence today on manslaughter and related armed robbery charges. 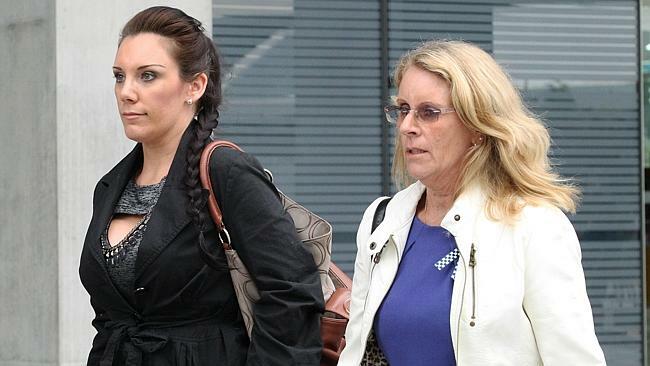 The mother of Det Snr-Cst Leeding told the court his killers were “not fit for society”. His sister also read a victim impact statement, saying she would follow the case for decades and fight any parole applications in the future.